The Sankara Nethralaya Academy (TSNA) is the academic wing of Sankara Nethralaya, the leading super speciality eye hospital based in Chennai. It is a one-of-its-kind academy which offers a distinctive series of educational programs ranging from certificate to doctoral level programs in various fields including allied health sciences like Ophthalmic Nursing, Operation Theater Assistants, Medical Laboratory Technology, Medical Records, Optometry, Ophthalmology, undergraduate & post graduate course in hospital management. The primary goal of the academy is to critically create a pool of comprehensive, well-trained health care professionals with the confidence and capability to meet the challenges in health sector. 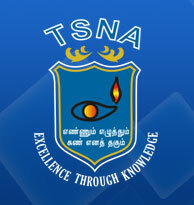 TSNA is a pioneer institute inculcating knowledge and skills pertaining to health care, research and hospital administration. Sankara Nethralaya accomplishes its excellence in education through its academy with all modern facilities, paving way for an excellent ambience for extensive learning. It provides the highest possible standards of professional competence and conduct to the health care practioners and administrative personnel around the world. It aims at enhancing their knowledge and expertise without compromising on professional ethics and quality education which helps them to do ordinary things extraordinarily well.